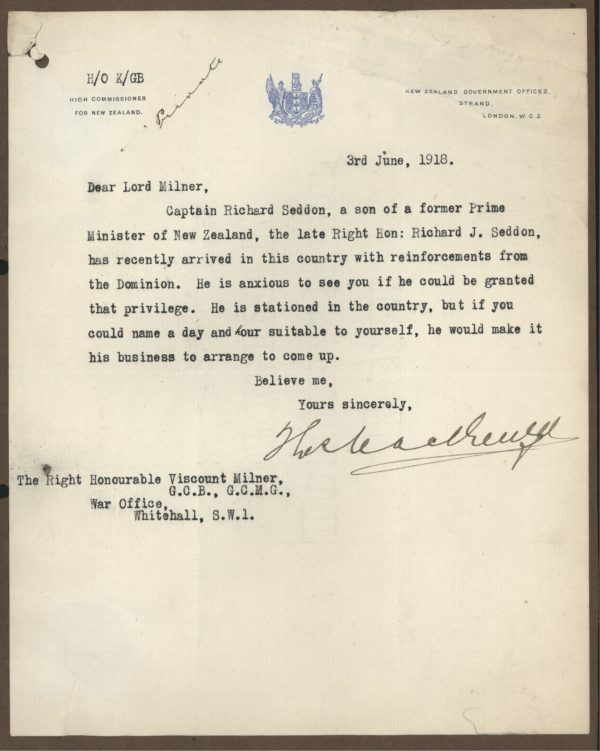 Letter Signed, as New Zealand High Commissioner during the final year of World War I, to Lord Milner at the War Office, introducing Captain Richard Seddon, “recently arrived in this country with reinforcements from the Dominion”. 1 page 10 x 8 inches, filing hole, somelight creasing, mounted on an old album page. New Zealand Government Offices, Strand, London, 3 June 1918. Sir Thomas Noble Mackenzie (1854–1930), Scottish-born New Zealand politician and explorer who briefly served as the 18th Prime Minister of New Zealand in 1912, and later served as New Zealand High Commissioner in London. Mackenzie was a notable explorer. He was a member of expeditions to the Tautuku Forest (1883), the wild country between Milford Sound and Lake Te Anau (1888; discovered the Sutherland Falls), and the Matterhorn Mountains (1888; discovered a pass between Lake Manapouri and Hall’s Arm). He was the first person to try to map an overland route to Dusky Sound (1894–1896). He crossed the land between Lake Te Anau and Lake Wakatipu in 1907.